Orthodox tradition holds that St. Luke the Evangelist wrote (painted) this icon, which later belonged to the Byzantine ruling family. Painted on linden and cypress boards, it is a Hodegetria or way-pointing icon, with the Mother gesturing toward her Son. When the Ottoman Sultan Mehmed II conquered the last Byzantine stronghold of Morea in Greece, the defeated emperor Thomas Palaiologos took the Virgin's image with him to Rome in 1460. Thomas's daughter Sophia brought it to Moscow in 1472, when she married Great Prince Ivan III, and sent it to Vilnius with their daughter Helena at her marriage to Alexander, King of Lithuania, in 1495. During World War I, the Russian Orthodox Church evacuated many of their sacred objects from the war zones. 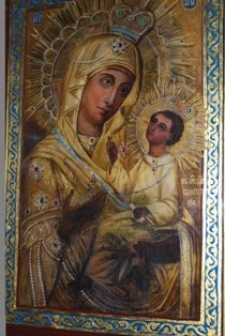 Church officials moved the Vilensky icon from the Holy Trinity Monastery in Vilnius to the Donskoi Monastery in Moscow. Two years later, the Bolsheviks closed the Donskoi Monastery, and the Vilnius Hodegetria was lost. The Holy Spirit Monastery in Vilnius preserves a copy. The Russian Orthodox Church celebrates the transfer of the icon to Vilnius on February 15 in the old calendar, February 28 in the new. It is also honored on April 14 / 27. For the better-known Vilnius icon representing the Virgin without the Child, see November 16.